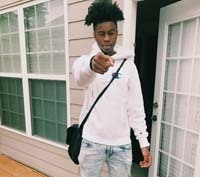 16 year old rapper from Atlanta born in New York. Originally from Gwinnet county now based in Fulton. Versatile rapper with different flows who can snap on any type of beat whether it’s a trap beat or a melodic beat. Making waves on SoundCloud, Apple Music and Spotify with over 40,000 streams so far. First music video “on go” came out recently. Debut project is expected to drop end of 2017. Up next and soon to blow up.